The sound of trickling water welcomed us to our morning. Even at 7 o’clock in the morning, we could hear people walking and bustling at nearby street. We took our time to get ready and thank God, that my husband felt a lot better than yesterday. 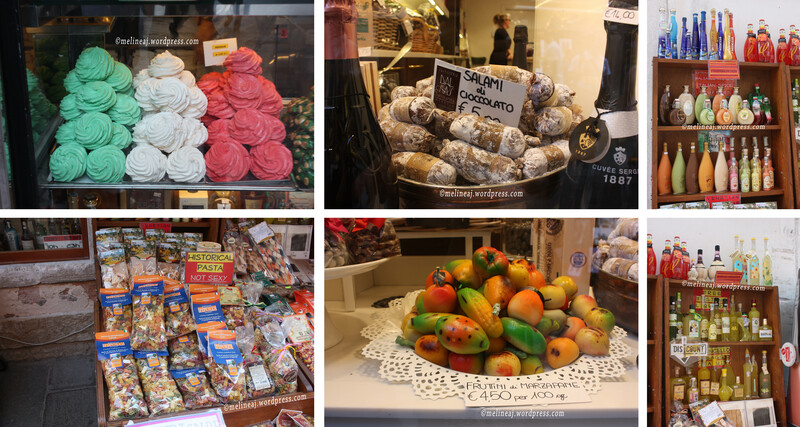 We walked to vaporetto station from Pizzale Roma to go to San Marco Square. 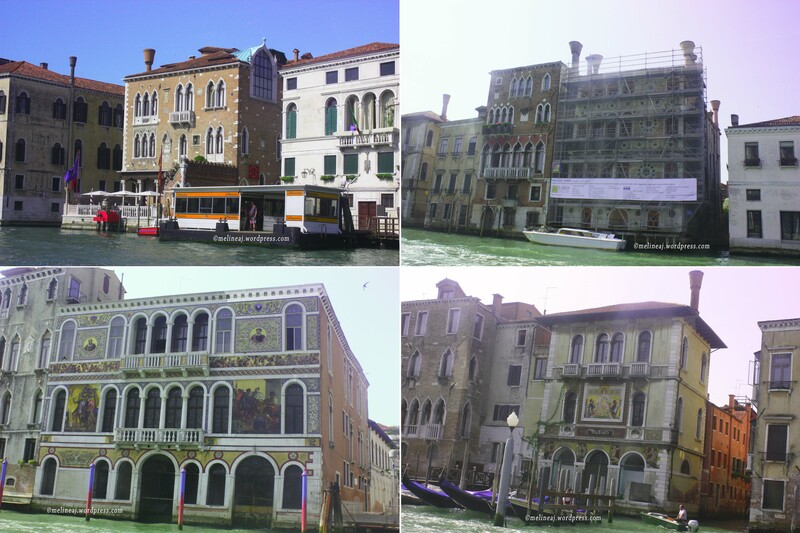 During our trip along the Grand Canal, we saw classic Venetian houses with their beautiful mosaics and passed Peggy Guggenheim Collection Museum. 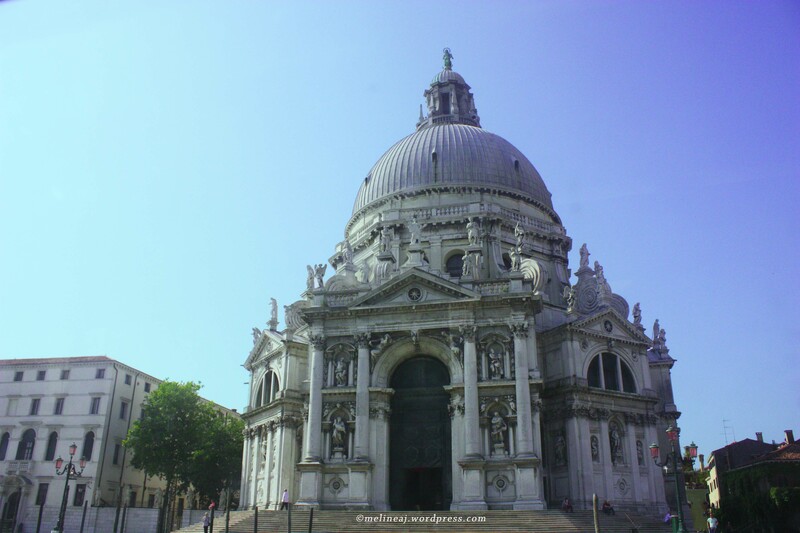 We also passed Santa Maria della Salute church that stands elegantly at the bank of the canal. We arrived at about 9.30 am at San Mark’s Square (Piazza San Marco). From the vaporetto station, we could see that the line up for entering San Marco Basilica was superrrr longgg…. 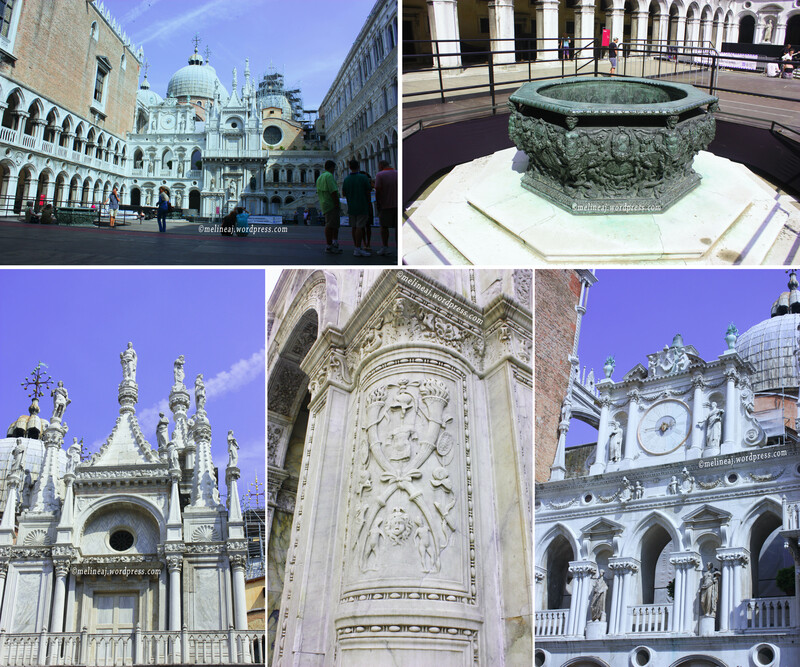 (HINT: if you want to visit San Marco Basilica but hate the long que, wait until after lunch – we only waited for 10-15 minutes!) 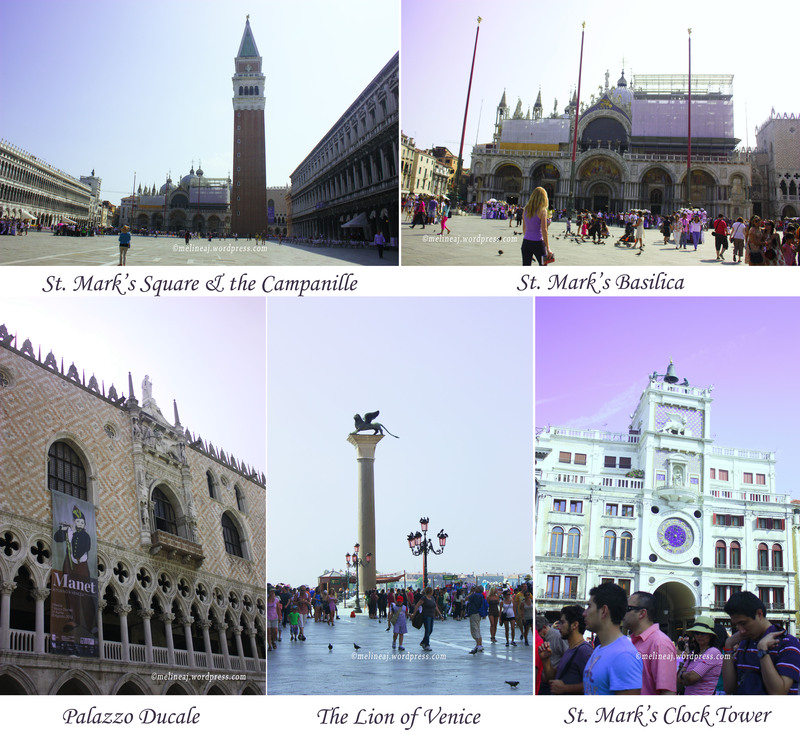 San Marco Square is the most efficient tourist area in my opinion hahaha… In one site, you can see 4 different attractions: San Marco Basilica, St. Mark’s Clocktower, Palazzo Ducale, St. Mark’s Campanille (bell tower), and the infamous The Lion of Venice statue! Next to the basilica, we saw that the line up for Palazzo Ducale ticket was pretty short, so we decided to visit Palazzo Ducale first. 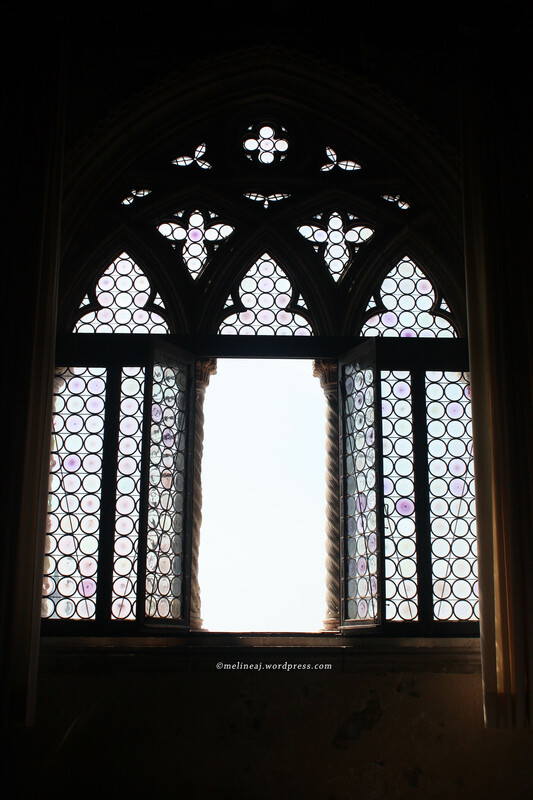 The entrance fee for Palazzo Ducale was €16. 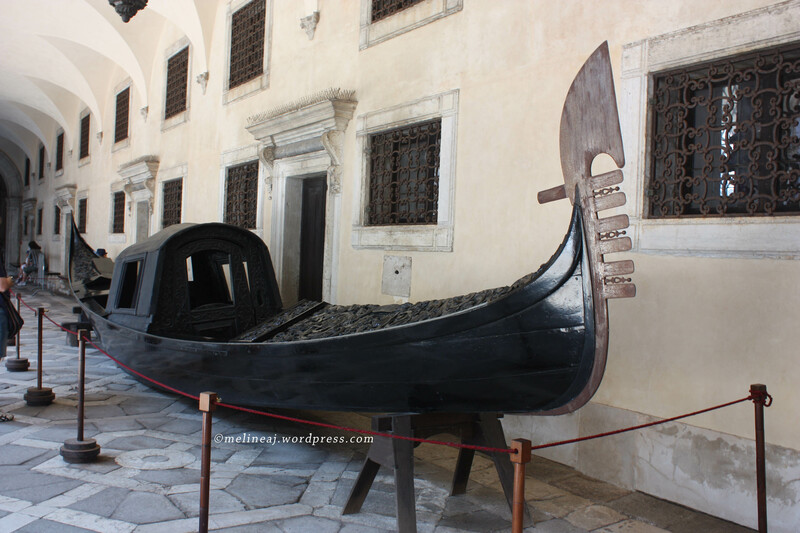 However, if you do want to visit more museums in Venice, you can buy a Museum Pass for €24. 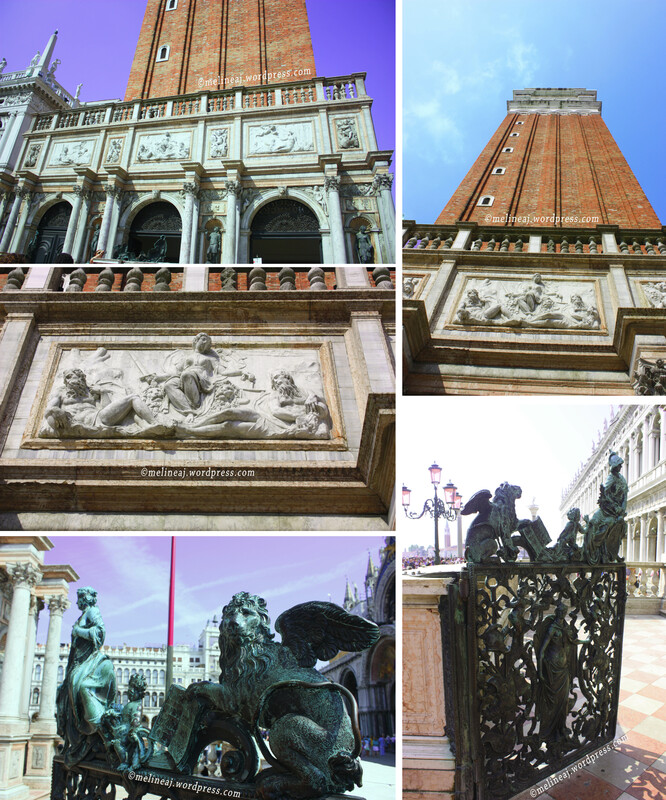 Palazzo Ducale or Doge’s Palace is a very famous Venetian landmark. It was used as government (Doge) building in the past. The building is connected to a prison on the other side by the famous Bridge of Sigh. 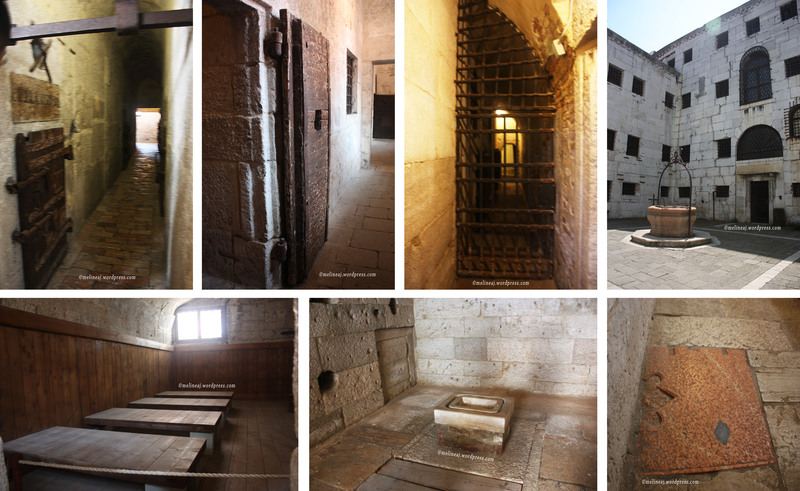 The legend has it that every prisoner who walked the bridge would have chance to see the beautiful Venetian sea one last time before going to windowless prison – and thus, he/ she sighed his/her freedom away. After buying the ticket, the lady instructed us to go to the entrance of the Palace that is on the front side facing the Canal. Once we were inside, there’s a small courtyard with 2 bronze wells on each left & right side. There was a construction for a play while we were there; so, there were a lot of scaffoldings and a stage in the middle. 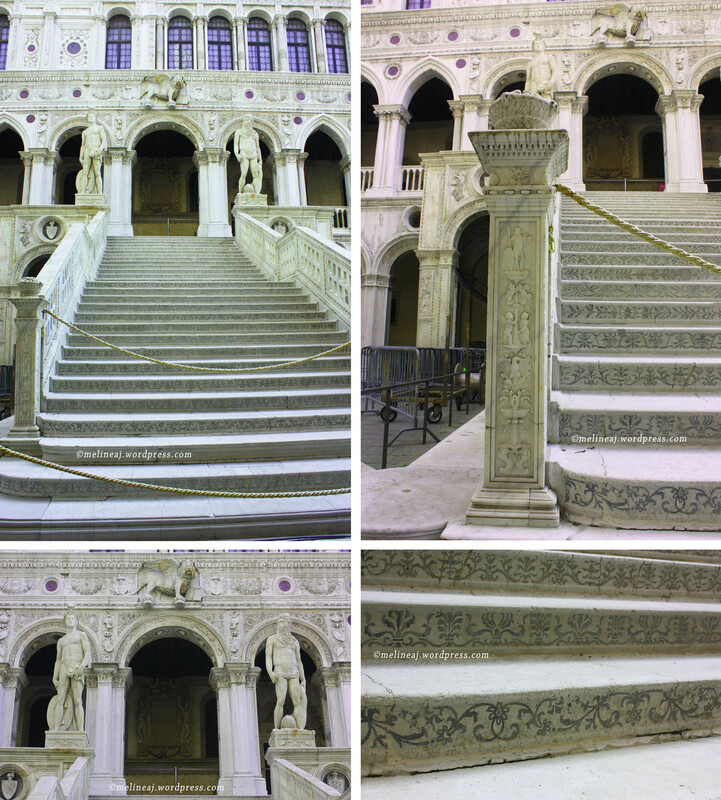 I was a bit disappointed 😦 Anyhow, we walked at the back of the stages and found a white marble staircase with beautiful and detailed carving on them – but it was closed for tourist. We then followed the sign and started our tour. 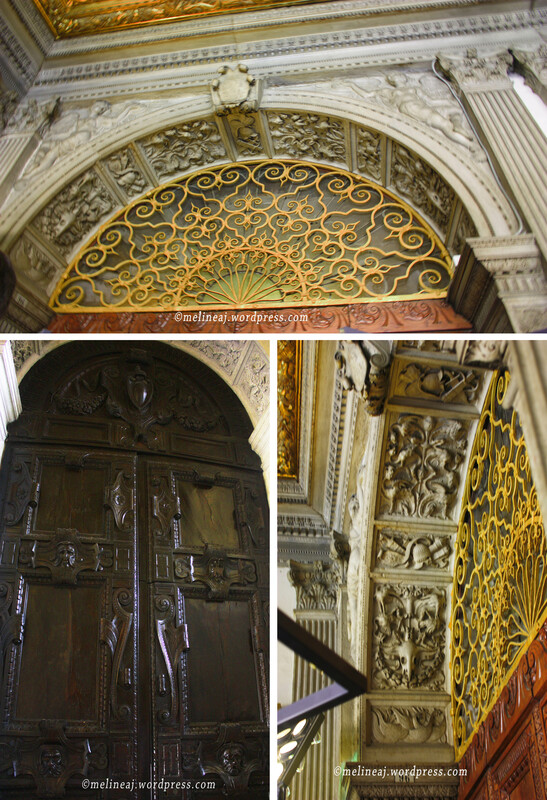 The first thing that struck us was the Golden Staircase (La Scala d’Oro) leading to the third floor of the palace! The gold paint on the ceiling gives a high contrast against the white marble floor & the details carving on the ceiling itself. At the third floor, we just floored by the beautiful golden paint and colourful frescoes on the wall & ceiling. Venetians were obviously not afraid to use colors to decorate their houses! 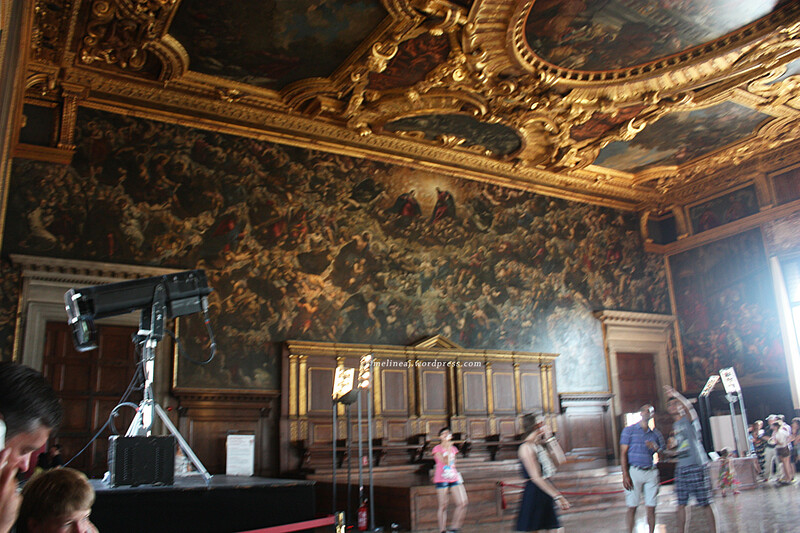 The interior inside Palazzo Ducale was also breathtaking! I just couldn’t get enough of the marble carving on the wall, ceiling, pillars, every where! They were super pretty and super awesome!!! Unfortunately, you can’t take pictures in some of sections. 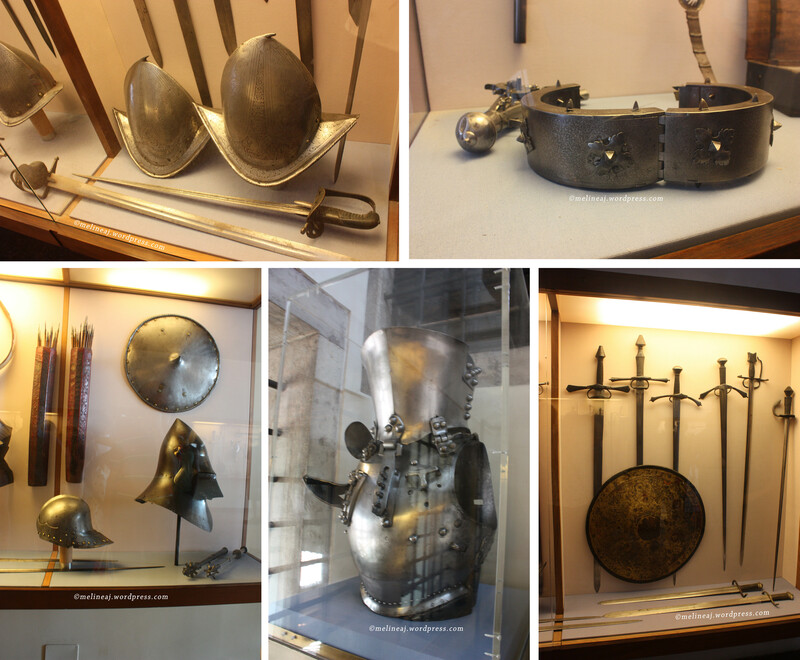 Continuing our tour, we entered the armoury museum. It has the biggest handcuff – or maybe neck cuff – I’ve ever seen! We entered a bunch of rooms with great frescoes but picture taking isn’t allowed 😦 At Guariento Room, we sat and enjoyed the infamous Il Paradiso painting by Tintoretto. We then proceeded to the famous Ponte dei Sospiri or Bridge of Sigh. The bridge has actually 2 pathways. From the Palace, we crossed the bridge overlooking the inner Venice and when we left the prison later, we crossed the bridge overlooking the beautiful Venice with its emerald water (this was the site where the legend started). The prison was not too spooky nor dark. The big iron bar with big spacing among them and wooden doors made me wonder if the prisoner could actually break free from their room hahaha… When we left the prison, we entered another room with a window facing the Bridge where you can take a picture of the outer bridge. 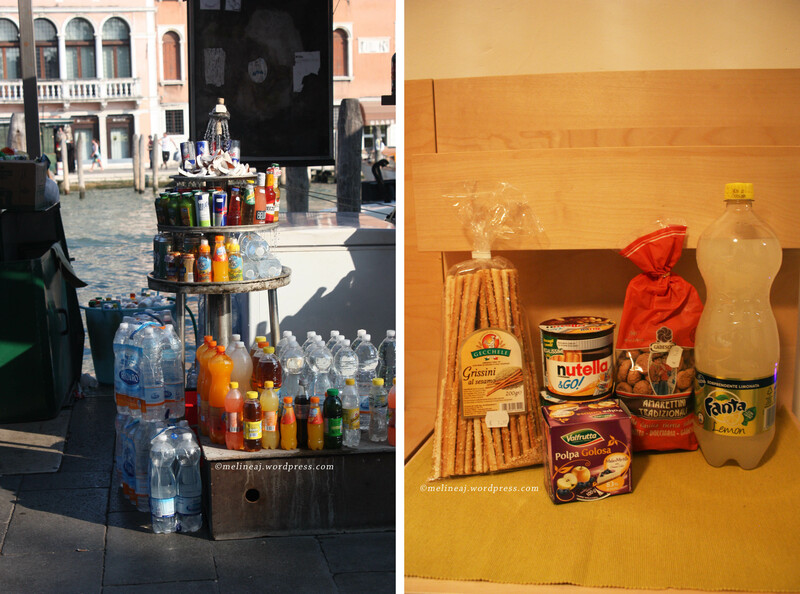 By the time we finished our tour of Palazzo Ducale, it was lunch time. We walked around the Square and found a small pizza place. 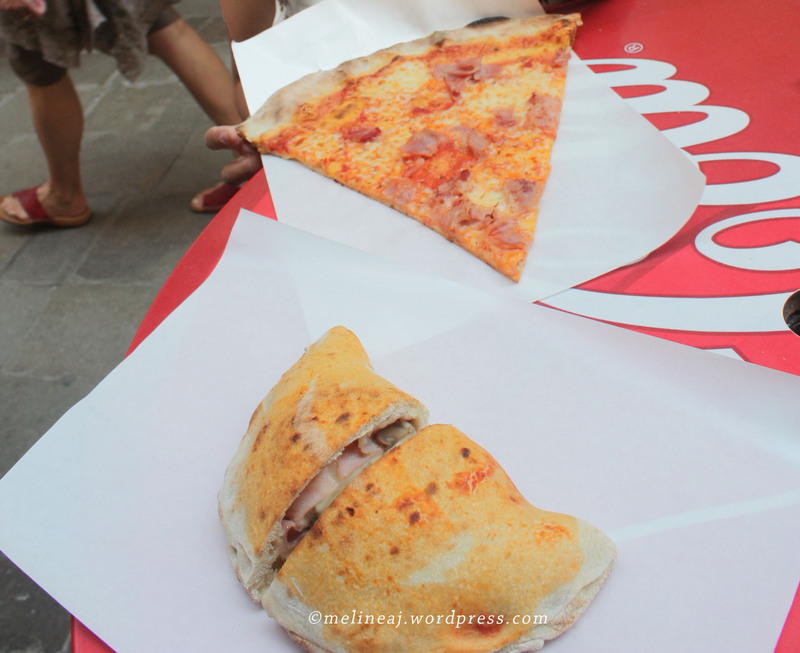 We bought 1 pizza & 1 calzone and the portion is huge! After lunch, we lined up to enter San Marco Basilica. By that time, the line was shorter and we only waited for 10-15 minutes. The important thing to remember is that NO tank top & shorts are allowed! I wore a cardigan and it was fine with the security. I saw so many women wearing tank top or dresses were stopped and the security forced them to buy an ugly plastic cover for €1!!! Also backpack wasn’t allowed. My husband went to a small storage area at west side of basilica as told by the security – there’s a map explaining where the storage is. The good thing is that the storage is free! According to the sign, picture and video are not allowed inside the basilica. However, I saw a lot of people took pictures and even the guard didn’t approach them. 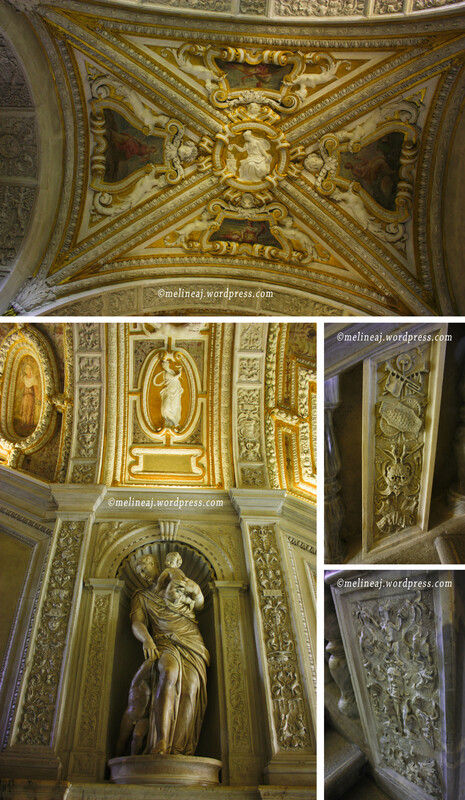 So, I snuck some pictures myself *naughty me haahahah* The main attraction of the basilica was the golden ceiling inside. However, don’t forget to look down at the floor too! 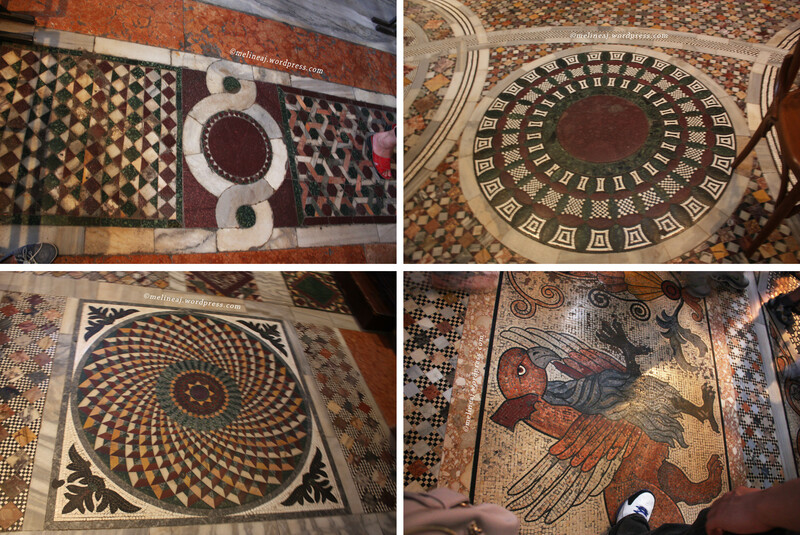 The mosaic tiles are pretty too! 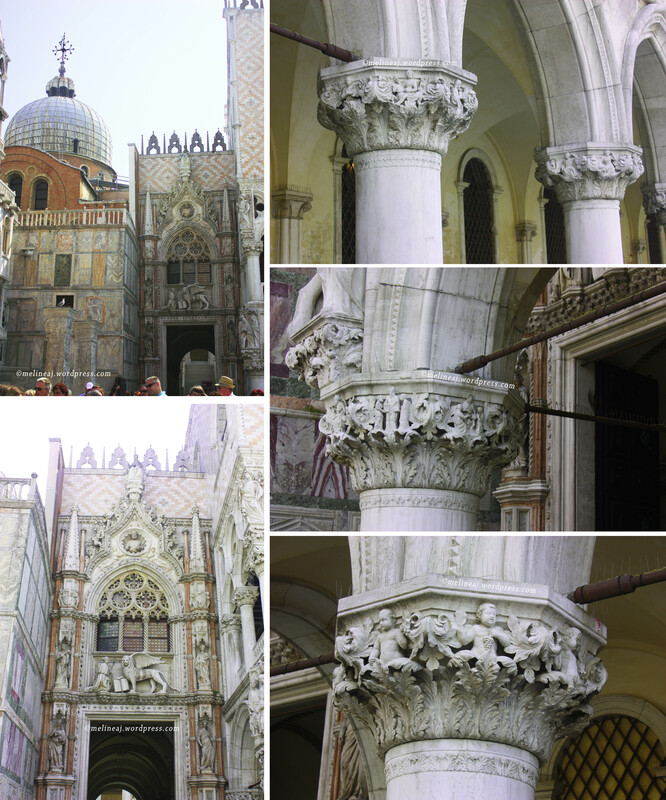 If you want, you can buy ticket to go to the upper floor of the basilica to see the original horses of Saint Mark. Oh don’t forget to take a lot of picture of the exterior of the Basilica, it was also amazing! 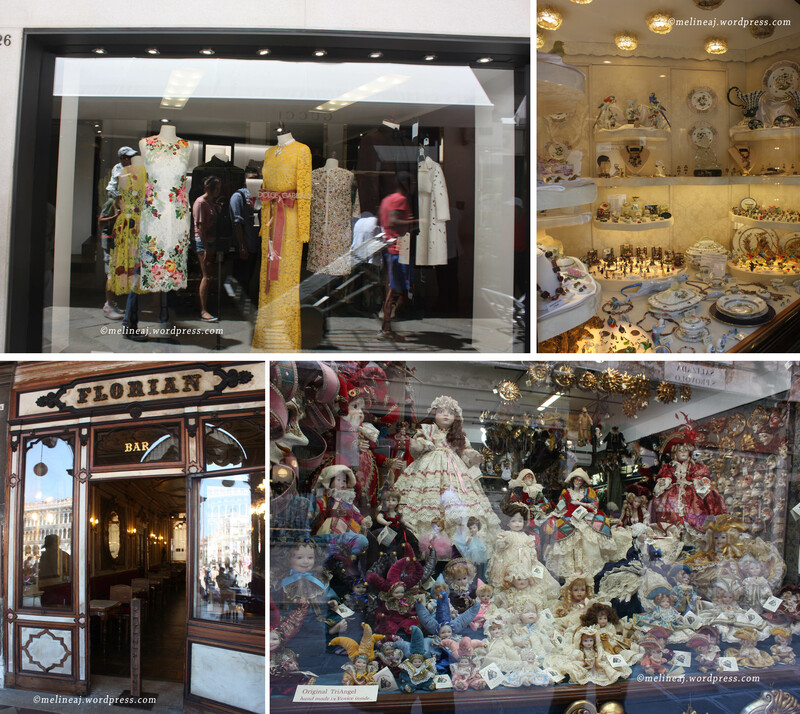 We window shopped around the Square across the basilica. Caffe Florian is located across the basilica. This is the oldest coffee house in Venice in which each room has different decorations to promote arts; especially the tea room that reminded me of Chateau Versailles. When we were tired, we decided to sit on the stair of the square and suddenly, a security volunteer came to us and warn us not to sit there. Actually, they put a sign on it but we didn’t notice it. Apparently, it’s a common thing for tourist to rest at the stair so that there were lots of security to warn them. We then went to Punta Sabiono using the vaporetto but there was nothing interesting there. 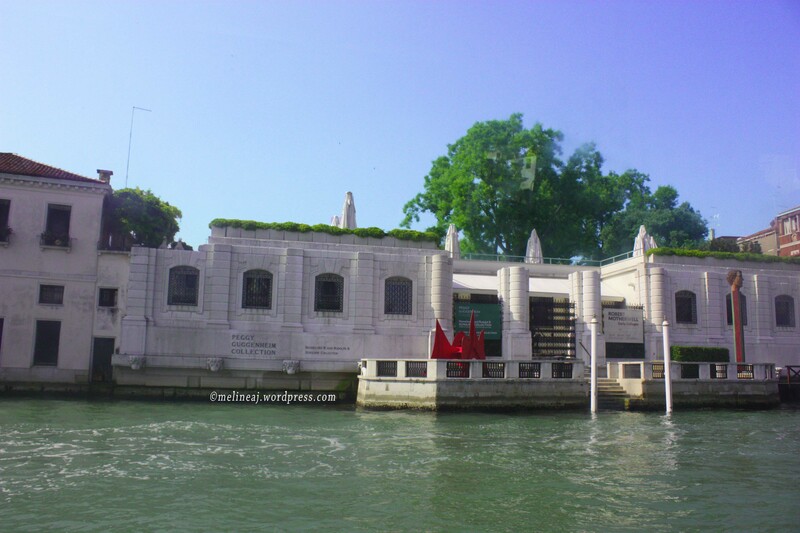 There is a parking lot where mainland Venetians parked their cars to cross to the island using vaporetto. Since it was super hot that day, we immediately went back to the island and stopped at Ferrovia Station. We then explored the west side of St. Lucia train station – near the Ferrovia vaporetto station. We found a self-serve restaurant called Brek that didn’t charge for seating fee! (Read my post on Venice day 5 when we had spaghetti al nero de seppia at Burano Island) We shared a delicious pickled squid, Carpaccio di poplo (€5.90) and a plate of 2 kinds of pasta (€7.50). The restaurant also has dessert, fruit, pizza, and coffee. The food was decent – just similar to any usual food court. On the way back to the apartment, we sat on the canal outside the building and enjoy the mellow evening in the most unique city in the world. 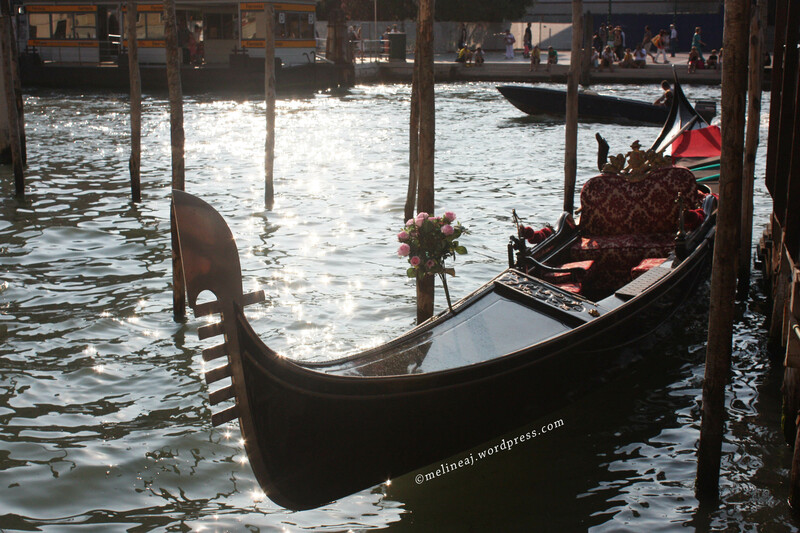 Gondola in the evening… so romantic…. Since it was our last night at Venice, we decided to explore the other side of the island: Croche & Dorsoduro. This area has lots of cafes & pubs. It seemed like lots of students gather here to eat and relax. 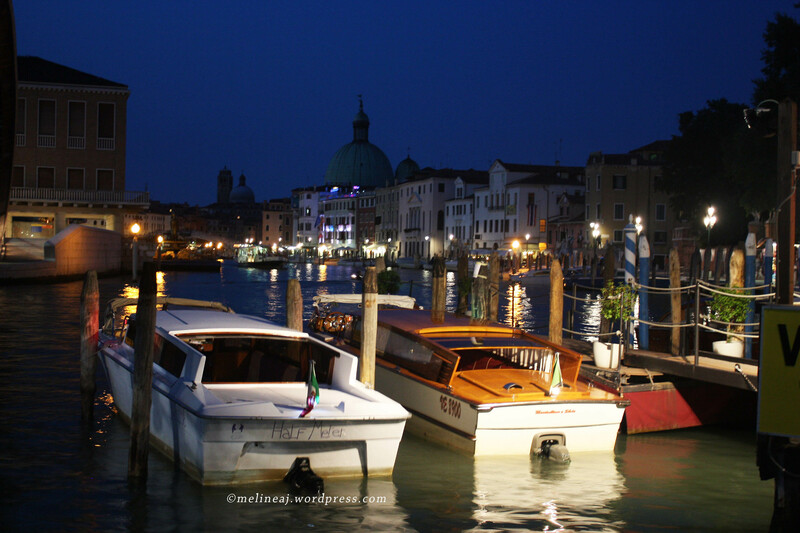 I’m already missing the mellow evening in Venice while I’m writing this! 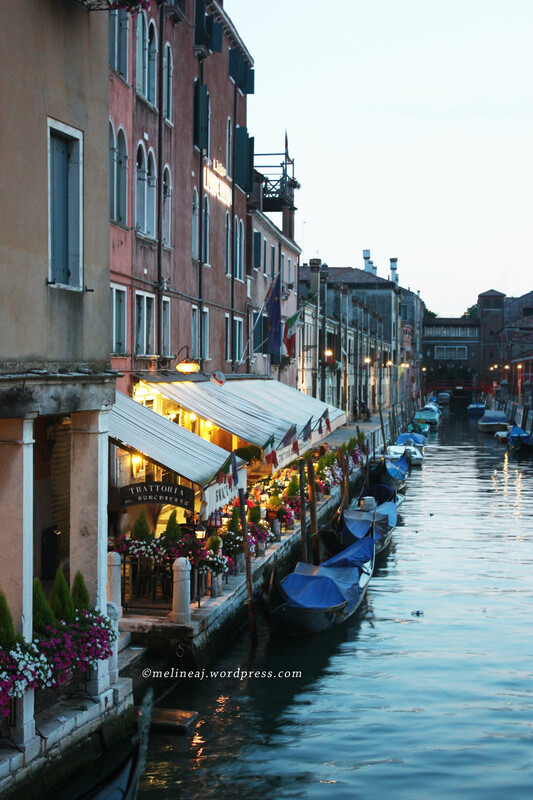 I now get why Venice is one of the most romantic cities in the world…. It’s the water! The delicate sound of wave and the reflection of lights on the water set the romantic mood all around the city!